Have you ever watched that show ‘Hoarders’ and thought “Holy God almighty, why on earth would someone keep a 20-year-old pickle jar?! ?” Well, a couple of days ago when I decided to clear out some of the clutter in my room, I found myself having a hard time parting with things like a day planner from middle school and a bracelet I made in jewelry class in 10th grade that was so ugly, it’s amazing I didn’t receive an F in the class. Suddenly it dawned on me: I’m as bad as the 20-year-old pickle jar guy. Suddenly, I saw myself as one of those people who has to make little passageways through their home to just to get through all of the piles of junk. This prompted me to make a complete overhaul of all of the useless things that have taken up residence in my room for far too long. 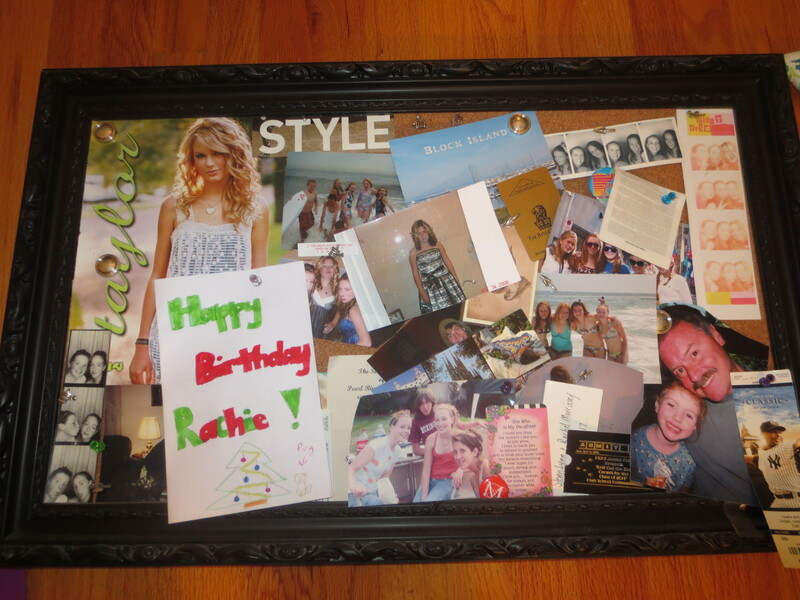 While tossing out about 60 birthday cards from my sweet 16, (yes, I clearly have a problem) I noticed that a cork board in my room was filled with a collage of pictures and magazine scraps that hadn’t been updated in a solid 8 years. I decided that this was the perfect opportunity to get ride of the bag of bags that has been growing for years (don’t act like you don’t have one!) and put them to good use. 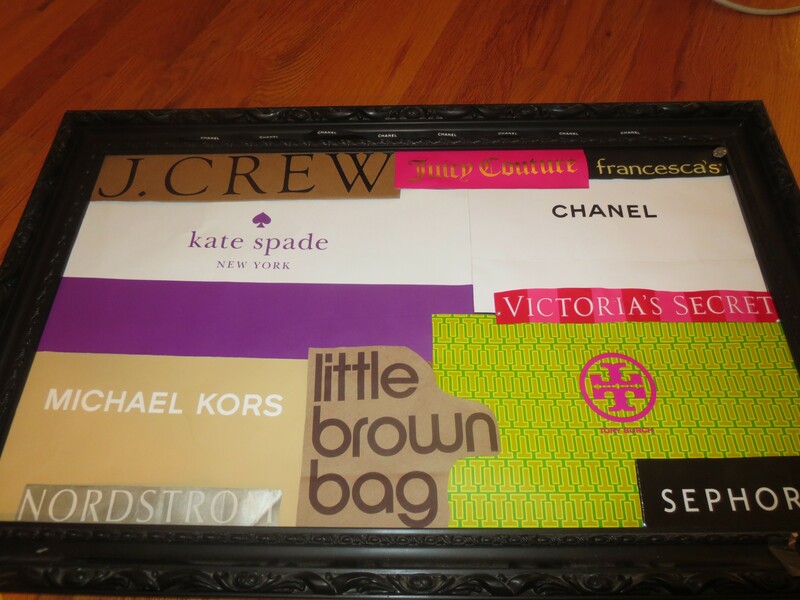 Check out how I updated the cork board in a fun, and sophisticated way. So, on the left is was I started with: a cluttered mess of pictures and momentos. To answer a few questions, yes I still love Taylor Swift, yes I still enjoy taking photo booth pictures, and yes Rachie is one of many nicknames I’ve acquired throughout the years (I’ve learned to respond to pretty much anything from Rach to Raquel). I put most of these things in a keepsake box that I started during my cleaning rampage and was left with a nice clean canvas. 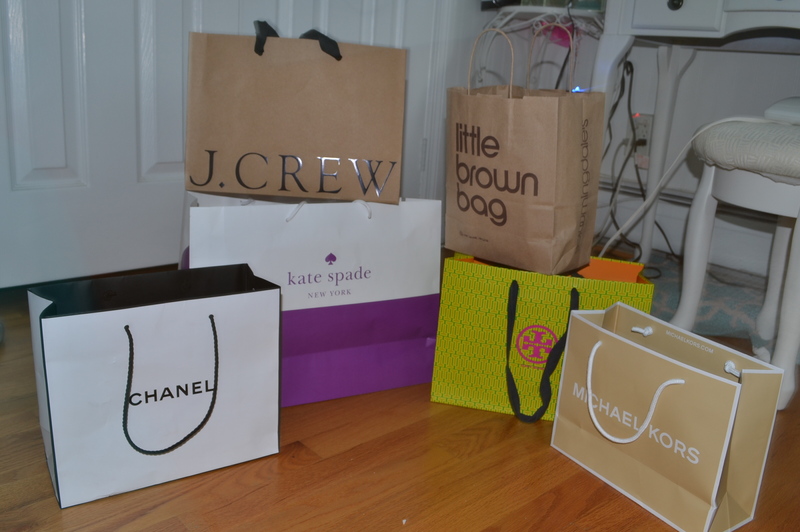 Next, I took whatever shopping bags I had and I cut them so that just the front of the bag was remaining. I learned two things during this process: (1) I seriously need to invest in a pair of left handed scissors #leftyprobs (2) crafts that you think will take an hour, inevitably take triple the amount of time. 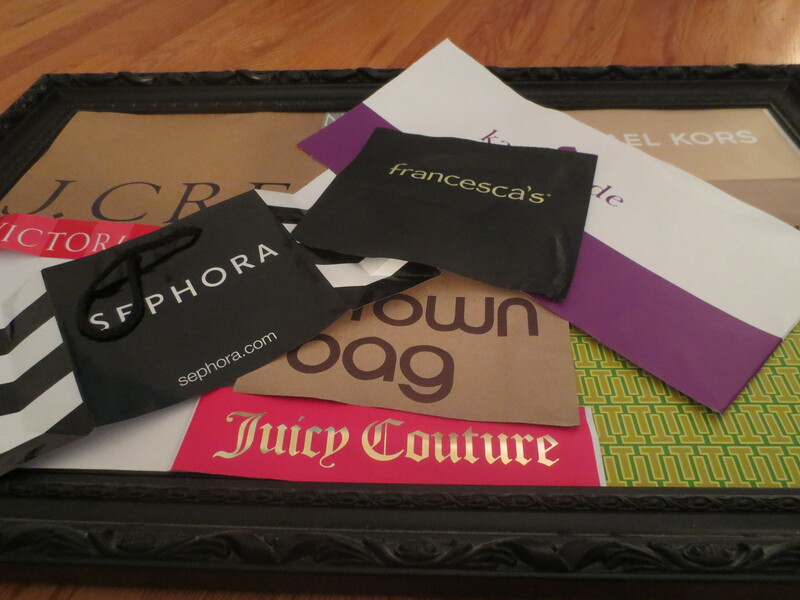 Next, I had to arrange the bags on the corkboard. I must have tried 30 different arrangements and every single time there was always a little sliver of cork peeking through. This led to a series of expletives which I will not repeat; I am a lady after all (lolz). Ultimately, with a little maneuvering and a lot of wine, I was able to find an arrangement that looked pretty decent! I taped everything down and hoped that nothing would budge. 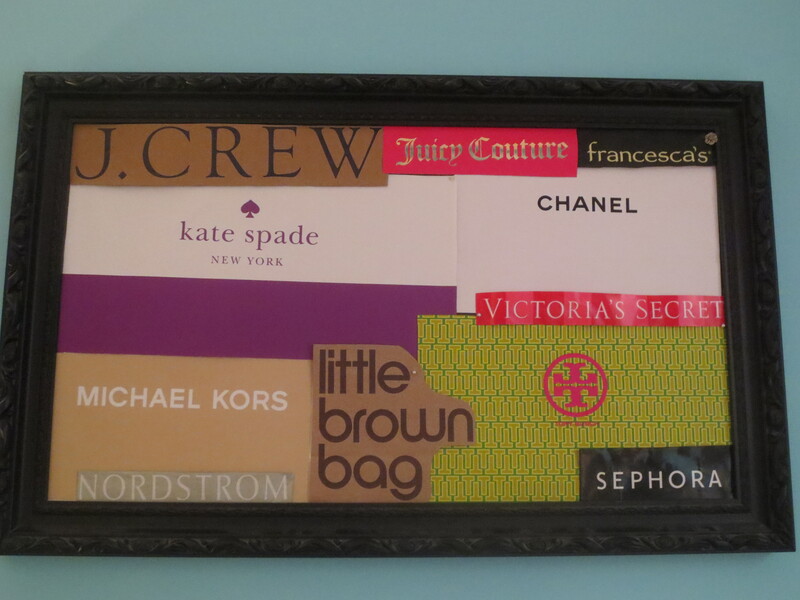 Finally, I rehung my new and improved cork board with an homage to some of my favorite stores. Note to readers: maybe consider not hanging things after a couple of glasses of wine. Ya know, just a thought. 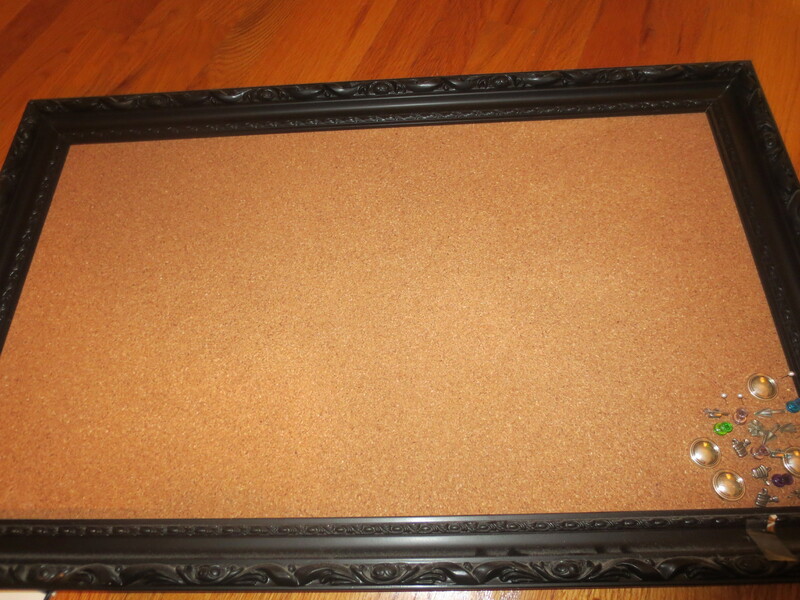 It’s not like I nearly dropped this giant cork board on my head or anything. Never happened. Overall this was a pretty fun project and I would definitely recommend it! What do you guys think? Would you try this project? Any thoughts on how it could be made even better? Lemme know peeps. Nothing makes me happier than to hear from you! This is such an amazing idea! I’m totally inspired by this! 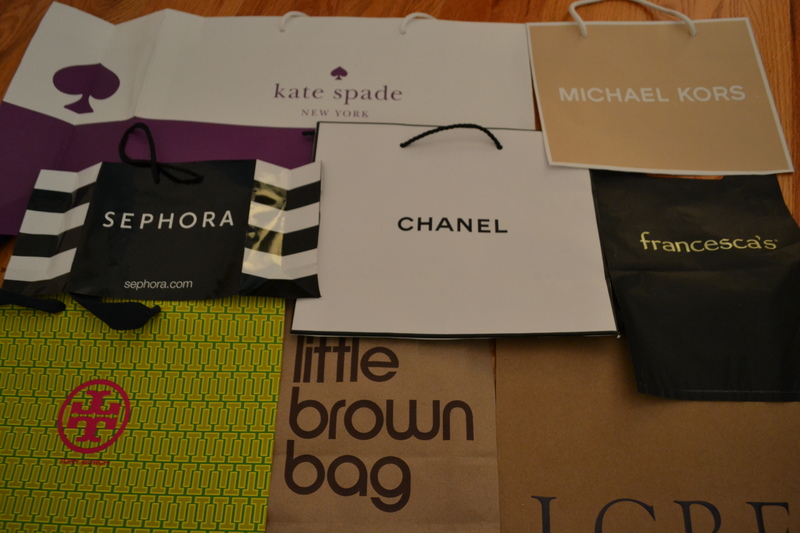 I think i’m gonna do one for my sister, only using the packaging from her fave perfumes. Looking forward to reading more from u!